As some may be aware, most of the larger MSTS route files were hosted on a file-hosting service at hotfile.com. The main reason for doing this was to avoid excess load on steam4me's server at VentraIP. As a result of a US Federal Court ruling, Hotfile.com was ordered to pay $80 million in damages because of copyright abuses. Hotfile elected to shut down its site completely rather than employ a filtering mechanism, taking everyone's files with it. This is probably a salutory lesson to those who believe that cloud hosting services are the way of the future. I've elected to bring all files "back home" to the steam4me site; you should be able to find everything you need here. When downloading routes, please DO NOT use download managers that permit multiple segmented downloads as these place an unacceptable (to VentraIP) load on their shared servers and may result in suspension of hosting for steam4me. Brian Bere-Streeter has now completed and released the "Short West and Short South route". This superb route encompasses the full Short West from Wallerawang to St.Marys in Sydney's west. The route extends onwards to Sydney Terminal (and Enfield and Darling Harbour) in the east. 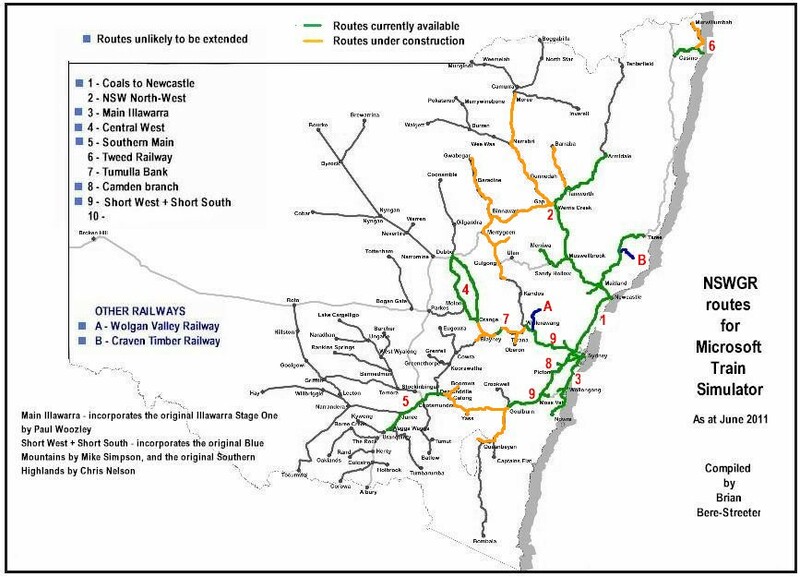 From Sydney terminal, the Short South traverses the Main South from Lidcombe (via Sefton) to beyond Goulburn. As well as creating much original route trackage, Brian has combined Mike Simpson's "Blue Mountains" route, Chris Nelson's "Southern Highlands" and part of Peter Newell's "Coals To Newcastle" route into a single seamless route that enables you to run westwards and southwards out of Sydney. Mainline mileage is 107 miles from Sydney to Wallerawang and 140 miles from Sydney to Goulburn, but actual trackage is much, much greater than this. The route is packaged in a steam4me-assembled installer which will ensure correct installation of all the route's files. Options to convert electrification and era will be placed in the "Start" menu to enhance your enjoyment of the route. Do take the time to read the comprehensive readme packaged with this route: it will enhance your enjoyment of this fine route. Special thanks also to Ted Palmer for his meticulous and tireless beta testing of this substantial route. Click on Read More below for more information and to start downloading this wonderful route. Brian Bere-Streeter's "The North Sydney Tram Lines" route is now available from its download page. Since its earlier release elsewhere, the route and its installer have been upgraded to make it more compact. This route represents the final two and a half years in the life of the Sydney Tramways - North Sydney Lines, from January 1956 to their permanent closure in June 1958.